This is the start of the whole thing. Comment: The following newspaper clipping includes the famous Eltanin antennae photo. Murray Bott sent the clipping copy to me [Peter Hassall]. It originally comes from Henk Hinfelaar's files. There is a hand written note (presumably by Henk) that says, "Taken 29.8.64 Time 1.25 AM Lat. 59.08 South Long. 105 West Depth 2250 Fathoms U.S. Eltanin". The American research ship Eltanin sailed into Auckland yesterday with a mysterious photo taken at 2250 fathoms 1000 miles west of Cape Horn. The photograph, which to a layman shows something like a complex radio aerial jutting out of the mud bottom, was taken on August 29 by a submarine camera. The photo on the cover [See photo in the news clip - CF] was taken by deep-sea camera at 13,500 feet by the oceanographic ship Eltanin, Aug. 29, 1964, 1,000 miles west of Cape Horn. There has been speculation on what the thing is, including suggestions that it is some sort of machine or electronic device -- artificial, but maybe not man-made. Interesting as this theory is, we wonder if maybe the answer is that it's just a "new" type of animal. Note the picture of the Umbellula, a long-stemmed polyp about three feet high with a cluster of hydra-like tentacles. This photo was made 350 miles west of the Cape of Good Hope, by the oceanographic ship Kane at a depth of 15,9OO feet. The Umbellula was known before the photo, having been dredged up before, when it was probably luminescent. The ocean deeps turn out to be more populated than was previously thought. In the middle of the nineteenth century, it was assumed that the enormous pressure would prevent anything except the tiniest animalcules from living below a few thousand feet. But as the 0hallenger expedition and succeeding ones scouted the deeps more and more was turned up, until now it is clear that life exists down as far as we have investigated. The oceanographic ship John Elliott Pillsbury recently brought up out of the Puerto Rico Trench, from a depth of about five miles, a fish of the genus Bassogigas. In the Morning of the Magicians, Pauwels and Bergier note a strange track found in the mud by oceanographic probes at 15,000 feet. We obtained copies of this photo, but additional photos have shown the creature making the track-- a type of acorn worm. These two cases suggest that some rather strange things must be living down there. The thing on our cover may be an animal as strange as we know how to imagine. The USNS Eltanin, an ice breaking cargo ship, was launched and acquired by the US Navy in 1957. Reclassified as an Oceanographic Research Vessel for the National Science Foundation in 1962, it became the world's first Antarctic research ship. On 29 August 1964 (per this account – see news clip at the beginning/CF) while coring and photographing the deep sea bottom West of Cape Horn, the Eltanin took the photo shown here. The position was 59:07'S by 105:03'W, depth 3904 meters. (See: http://www.larryhatch.net/EMPTYQ.html for Larry’s map with location of the ship). 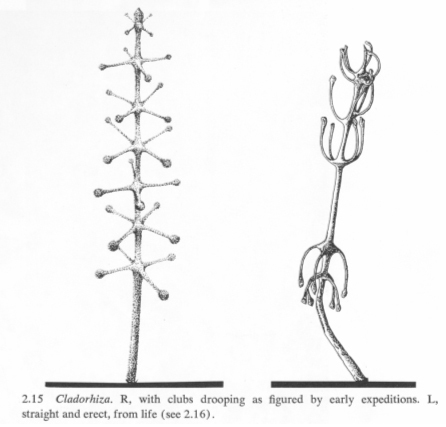 The "Eltanin antenna" is a sponge, Cladorhiza. An extract from The Face of the Deep: "Cladorhiza, a particularly dramatic [sponge] which somewhat resembles a space-age microwave antenna, was not uncommon in the early dredge hauls of Challenger and Blake (2.15). Agassiz observed that 'they are sponges with a tong stem ending in ramifying roots, sunk deeply into the mud. The stem has nodes with four to six club-tike appendages. They evidently cover like bushes extensive tracts of the bottom’”. The familiar Eltanin photograph shows only a solitary specimen. Otherwise it would be more apparent that it is a marine animal and not a manufactured object. The drawing was re-drawn from a figure in Three Cruises of the Blake, by Alexander Agassiz, Riverside Press, Cambridge, HA 1888 #2: Fig 541 (Three Cruises was 2 volumes, now both out of print. It may have been reprinted in the 1960s. It is packed with photos of life on the sea bottom. Tom DeMary deserves major credit for rediscovering the true nature of the 'Eltanin Antenna'. He contacted the marine biologist who pointed out the sources above. All of this was well known to the relevant biologists, but totally ignored it seems by the 'new age' people, numerologists and anomalists of all sorts. It’s a pity that anomalists and scientists don't consult one another. This is the original uncropped photo, giving the (often mistaken) location and identification. The source is noted above. A Google search for Eltanin Antenna brings up about 250 websites. Add the word 'sponge' and you might find three or four. This reference: http://www.larryhatch.net/ELTANIN.html. All images and text strictly Copyrighted ©2003 by Larry Hatch. UFOCAT URN – 037997 Computerized Catalog (N=3173), #1654 by L Schoenherr. No © date.